Every Wednesday night at the Fond du Lac Public Library, Dr. Rick Whaley and Herman Bender march their way through the Revolutionary War in vivid detail. The duo’s series, “Big History: America’s Rising, 1777-1789, Politics, War & Freedom,” captures all the drama of that time at 6 p.m. weekly through April 3. The programs are free; no registration required. They are covering the Revolution in depth. Topics include the end of the war in 1783; the Northwest Territorial Act, which created five states (including Wisconsin); the failure of the Articles of Confederation; and the Constitutional Convention of 1787-89, which gave us the Constitution of the United States, including the Bill of Rights. This is the sixth year the pair has presented wildly popular American history programs at the library. They estimate they’ve attracted about 5,000 attendees over the years. Whaley retired in 2015 after 43 years of teaching, the last 22 years in Marian University’s History Department, where he taught American history, geography, American government and honors classes. He received his master’s and doctorate in history from the University of North Dakota. Whaley’s particular interests include American history and the Civil War. He’s traveled extensively in the United States and Europe. Bender is an independent researcher, writer and editor. His professional background includes geology and a technical field in industry. His writings are published internationally in the fields of applied geophysics, cultural landscape studies, prehistoric trails, archeoastronomy (prehistoric astronomy beliefs plus site investigations) and cosmology as a recognized specialist in Plains and Woodland Native American astronomy traditions. 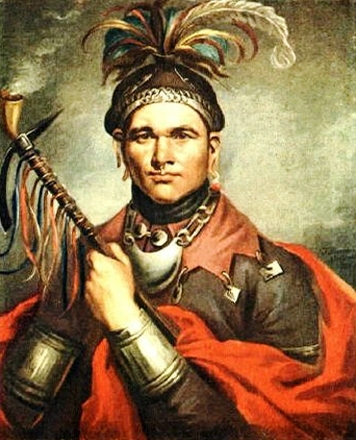 Pictured: Chief Cornplanter was a Seneca war chief and diplomat. He fought on the British side in the Revolutionary War but led negotiations with the fledgling United States after the war.